Home > Books > What a Team! Mr. Badger and Mrs. Fox 3: What a Team! Is teamwork impossible for these brothers and sisters? 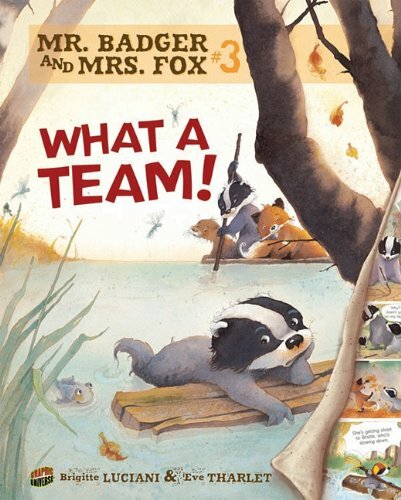 Badger brothers Grub and Bristle want to build a boat with their friends, but their new fox sister Ginger always tries to take charge. Everyone has a different idea about what to do. Bristle wants to build a kayak. Ginger wants a sailboat. And baby sister Berry wants to help, but she can't even swim. Soon all they've built is a big argument. The only way to decide whose idea is best is to have a race down the river! Will the race prove one of them right, or will teamwork win the day? About Eve Tharlet (Illustrator) : Eve Tharlet is a published illustrator of children's books. A published credit of Eve Tharlet is Davy, Soccer Star.